Having an organized home isn’t difficult in theory, but it is putting the information that you have and using it. There are different techniques that you can use to help; however, there is no miracle to do the work for you. It is important to understand that you do have to work at your organization, these skills are obtainable, they are not out of your grasp or from another galaxy but like anything, you have to make them work for you to see the results. These tips are not in any order of importance, you have to work at them all to see a complete difference, however, it is possible to tackle a few of them and see a difference in your home. A daily plan, if you don’t know what you have to do then you are not going to make the most of the time available. You need a plan what needs doing and if you or your family have any appointments, without a daily plan you could miss these and this spells disaster. Create a budget, this will make you accountable for your finances and this is important, you can’t have an organized home without a budget. I wrote an article on this topic that you will like, It’s Easy To Make A Budget. To-do lists, these are part of your daily plan, or separate, it depends on how you work, but they are still an important part of your planning, without a to-do list, it is difficult to keep on top of the chores and jobs around your home. Long-term planning is important, it allows you to plan and prepare in advance the bigger picture and this is important. You need to know where you are heading and what dreams you have. Without these, you might find that finding your direction in life difficult. Seasonal planning, this is to ensure that you take into account the different jobs, tasks and events that happen at different times of the year. Without seasonal planning, you can miss out some vital steps of an organization that can affect the rest of the season. Unless you have a photographic memory then it is important to write things down. It allows you to not clog your brain with dates or lists and it allows the action to happen; if you write down what you need you are more likely to stick to the list when you shop. Make a schedule, this is different from a daily plan, this is when you actually schedule in different activities during a set time. I know that I do tea prep from 5 pm during the week, so I never book any appointments at this time. Give yourself deadlines, without these you can put off doing things without any consequences and this isn’t a way to have an organized home. 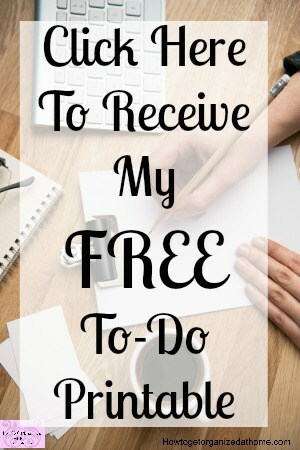 Don’t procrastinate, don’t put off what you can do today, if you have tasks to do it is easier to focus and get the jobs complete and then you have free time. In your home every item that you own needs to have a home, somewhere they belong. Without a home, they become clutter and it takes longer to clean your home. Clutter is a major problem when it comes to an organized life, there is no organization if there is clutter; you have to tackle the clutter first. Don’t buy bargains or deals that you won’t need or use, they are not a bargain they are a waste of money and result in clutter in your home. Learn to delegate; get other people to help in your home. Don’t spend hours and hours looking for the perfect system, you will never find it. You have to work with what you have and the perfect system for you will come to you. Organization doesn’t happen by itself, you have to work hard at it. Therefore, it is important to remember that organization is going to take time, you can’t organize a whole home in a day, it is a slow process and one that takes time, but there are things that can help you get and stay organized. 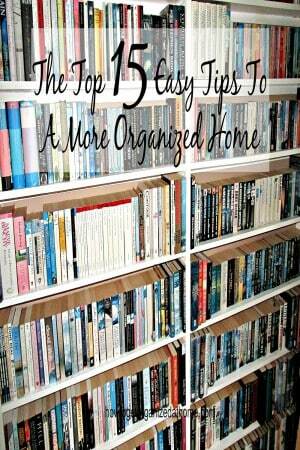 What is your top tip for an organized home? 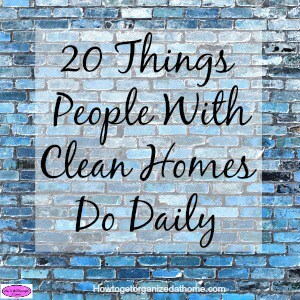 I wrote an article on 20 Things People With Clean Homes Do Daily, I think you will love it! Another useful post, Sharon. Thanks. I’m working on that not procrastinating one, but I’ve got my daily plan and although I don’t always stick to it I get the essentials done now. #6 is the most important for me. I get so stressed if I’m trying to carry stuff around in my head. If I have a reliable place to write it all down, my stress level instantly gets cut in half. I am working on decluttering – again! Point 11 is most relevant to me at this time. I think clutter breeds when I am not looking!